Phil Dankner has been Featured in the News! FORT COLLINS — An investment group in California has acquired two apartment complexes in Fort Collins for $21.6 million. Using the entity WSRH Fort Collins LLC, the investors purchased Prospect Station I & II, a pair of apartment buildings with 68 units at 221 W. Prospect Road and 303 W. Prospect Road for $15.6 million, and the 24-unit Kansas Apartments at 2802 Kansas Drive for $6 million. Rayno Seaser, co-founder of the Egg & I restaurant chain; Steve Spanjer, president of Spanjer Homes; Connie Dohn of Dohn Construction Inc. in Fort Collins; and investors sold Prospect Station I and II that were built in 2014 and 2016, respectively. Dohn Construction was the general contractor for both projects. Dohn and other investors, using the entity 1409 Elizabeth LLC, sold the Kansas Apartments, which also were built by Dohn Construction. Dohn said the properties were not on the market. She said the investment group was looking for new apartments near a university in a growing area. Prospect Station consists of eight studio units, 36 one-bedroom, 20 two-bedroom and four three-bedroom apartments. A commercial space is occupied by Mountain Iris Café. The apartments feature European frameless cabinets, granite slab countertops, balconies, in-unit washer/dryer and wood flooring. The property includes reserved covered parking, elevator access, secured buildings and a gathering space/picnic area. Prospect Station is rented primarily to young professionals and faculty/staff of the neighboring Colorado State University. 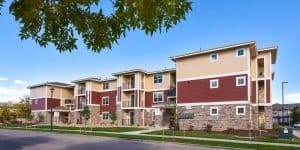 The apartments are within walking distance to Colorado State University campus and Prospect Max station that provides access to midtown and downtown Fort Collins. Kansas Apartments is a three-story building with 21 two-bedroom units and three three-bedroom units. It was built in 2016. Apartments have a fireplace, den, private balcony, washer/dryer, walk-in closets and high-end finishes. Phil Dankner of the Greystone Unique Apartment Group represented the buyer in this transaction, while Alex Schuman of Schuman Cos. Inc. in Fort Collins represented the sellers. Wilcox Street Apartments Sell for $1,300,000; 12 Unit Apartment Complex Sells for the First Time in 17 Years!